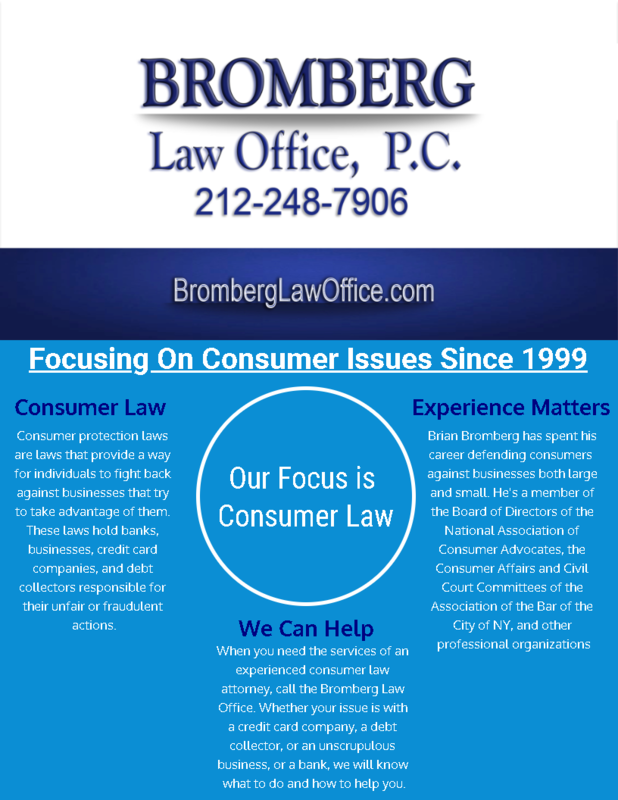 Here at the Bromberg Law Office, our entire focus is Consumer Law related issues. That means, all we do is Consumer Law. Because of that, you can rest assured that your case will receive the full attention of our office. It also means that we are uniquely experienced and knowledgeable in all things related to Consumer Law. If you are being harassed by debt collectors, have errors on your credit report, are being sued by over a debt, have a judgment against you, are receiving robocalls, have been a victim of identity theft or auto fraud, or have been injured financially by a business, we can help you. We have been fighting for consumer rights since 1999. We have a winning track record and the knowledge and experience you need on your side fighting for you. If you are suffering from any of the issues mentioned above, please call our offices today at 212-248-7906 to schedule a free consultation or fill out the contact form below. We will explain all of your options to you so you can make the best decision for your situation.